Victoria Info Ihonui is your first stop for general University help, directions and information. 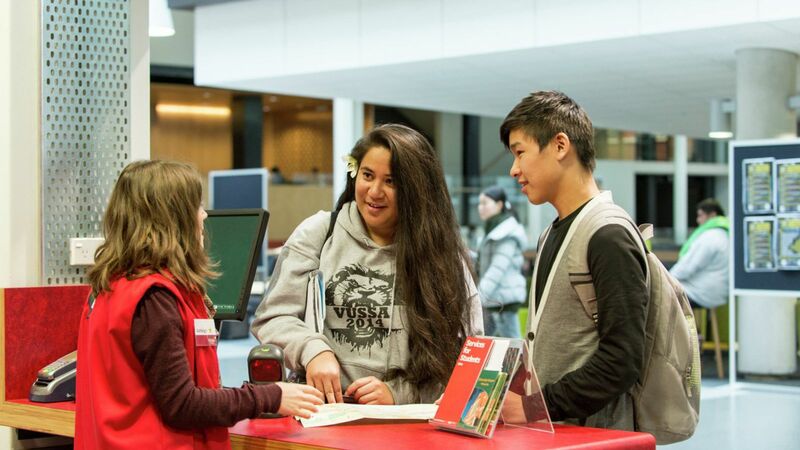 Visit any Victoria Info Ihonui location for guidance as you find your way around campus or to ask questions about anything to do with Victoria, including student services. Find Victoria Info Ihonui on Level 1 at the main entrance to the Hunter Building on Kelburn campus. The Hunter team can also point new students in the right direction for assistance with completing their enrolments. Victoria Info Ihonui is located at both the Level 1 and Level 2 entrances to Kelburn Library in the Hub. Level 2—during library opening hours, which include weekends. The Hub team also provide general library assistance, IT help and referrals to specialist library and learning support services. Subject librarians can help you research and improve your search skills. Victoria Info Ihonui can put you in touch with a your subject librarian between 9am and 5pm on weekdays. Outside those hours, you can contact them directly. a 50 minute one-on-one appointment (book in advance) to be held at Student Learning. Come to the Level 2 library entrance on Thursdays during the trimester to speak to a Justice of the Peace (12noon to 1pm). Victoria has our own police liaison officer, Benjamin Hopkins, who is available to give advice and speak to staff or students who may have been the victim of crime. During Trimesters One and Two, Benjamin is available on campus at Vic Info Ihonui, Level 2 at the Hub, on Thursdays from 10 to 11am. He is available to speak with students and staff informally, give them advice and if necessary refer them to meet more privately with someone from the Police. Te Aro Info Ihonui is located on the ground floor of Te Aro Campus, in Vivian Street. Student enquiries are welcome from Monday to Friday, 9.30am to 4pm. The Te Aro team is part of the Student Administration Office at the Faculty of Architecture and Design. Services include enrolment, degree planning, credit transfer, exams, graduation and other enquiries about programmes. Student Advisers are the first point of contact for admission requirements, degree planning, changing courses and transfer of credit from other tertiary institutions. They can also help with enrolment, organising exams and maintaining student records. For help with any issues that may prevent you from achieving your full potential please feel free to talk to the Associate Dean (Students). The preferred days for tours of the Te Aro Campus are Mondays and Fridays at 9.30am. Bookings can be made at Te Aro Info Ihonui. Please book at least two weeks in advance. We often have a selection of lost property, so if you’re missing something please ask at the desk. Academic transcripts are available. To order yours, just fill in the required form available from the desk. Pipitea Info Ihonui is located on the ground floor of Rutherford House and can be accessed through the Lambton Quay entrance. Student enquiries are welcome from Monday to Friday, 8.30am to 5pm. The Pipitea team also provide student and academic services to Commerce students, including enrolment, degree planning, credit transfer, examinations, graduation and other general enquiries.